Neuroscientists at the University of Pittsburgh have identified the neural networks that connect the cerebral cortex to the adrenal medulla — the inner part of the adrenal gland, located above each kidney, which is responsible for the body’s rapid response in stressful situations. These findings, reported in the online Early Edition of the journal Proceedings of the National Academy of Sciences PNAS), provide evidence for the neural basis of a mind-body connection. They also shed new light on how stress, depression, and other mental states can alter organ function, and show that there is a real anatomical basis for psychosomatic illness. The research also identifies a concrete neural substrate that may help explain why meditation and certain exercises such as yoga and Pilates can be so helpful in modulating the body’s responses to physical, mental and emotional stress, according to senior author Peter L. Strick, Ph.D., Thomas Detre Chair of the Department of Neurobiology and scientific director of the University of Pittsburgh Brain Institute. In their experiments with monkeys, the scientists traced the neural circuitry that links areas of the cerebral cortex to the adrenal medulla, using a unique tracing method that involves rabies virus. This approach is capable of revealing long chains of interconnected neurons. Another surprising result of the research was that motor areas in the cerebral cortex, which are involved in the planning and performance of movement, provide a substantial input to the adrenal medulla. One of these areas is a portion of the primary motor cortex that is concerned with the control of axial body movement and posture. This input to the adrenal medulla may explain why core body exercises are so helpful in modulating responses to stress. Calming practices such as Pilates, yoga, tai chi and even dancing in a small space all require proper skeletal alignment, coordination, and flexibility to avoid harm to the body. These anatomical findings have relevance for therapies that deal with post-traumatic stress. Additional links with the adrenal medulla were discovered in cortical areas that are active during mindful mediation and areas that show changes in bipolar familial depression. “One way of summarizing our results is that we may have uncovered the stress and depression connectome,” says Strick. Overall, these results indicate that circuits exist to link movement, cognition and affect to the function of the adrenal medulla and the control of stress. This circuitry may mediate the effects of internal states like chronic stress and depression on organ function and thus provide a concrete neural substrate for some psychosomatic illness. This research was funded by National Institutes of Health and the Pennsylvania Department of Health. Modern medicine has generally viewed the concept of “psychosomatic” disease with suspicion. This view arose partly because no neural networks were known for the mind, conceptually associated with the cerebral cortex, to influence autonomic and endocrine systems that control internal organs. Here, we used transneuronal transport of rabies virus to identify the areas of the primate cerebral cortex that communicate through multisynaptic connections with a major sympathetic effector, the adrenal medulla. We demonstrate that two broad networks in the cerebral cortex have access to the adrenal medulla. The larger network includes all of the cortical motor areas in the frontal lobe and portions of somatosensory cortex. A major component of this network originates from the supplementary motor area and the cingulate motor areas on the medial wall of the hemisphere. These cortical areas are involved in all aspects of skeletomotor control from response selection to motor preparation and movement execution. The second, smaller network originates in regions of medial prefrontal cortex, including a major contribution from pregenual and subgenual regions of anterior cingulate cortex. 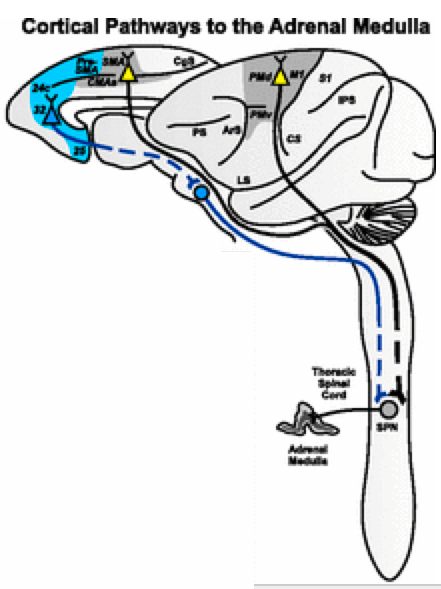 These cortical areas are involved in higher-order aspects of cognition and affect. These results indicate that specific multisynaptic circuits exist to link movement, cognition, and affect to the function of the adrenal medulla. This circuitry may mediate the effects of internal states like chronic stress and depression on organ function and, thus, provide a concrete neural substrate for some psychosomatic illness.